So your Raspberry Pi has just arrived in the post and you're anxious to get playing, but alas, you don't have a spare keyboard, mouse and monitor at hand or you can't use any of the monitors and TVs available to you. This post details how you can use a single computer and network cable to get your Raspberry Pi up and running with VNC without ever having to connect a keyboard, mouse or monitor to it. Download the latest Raspberry Pi SD Card image. 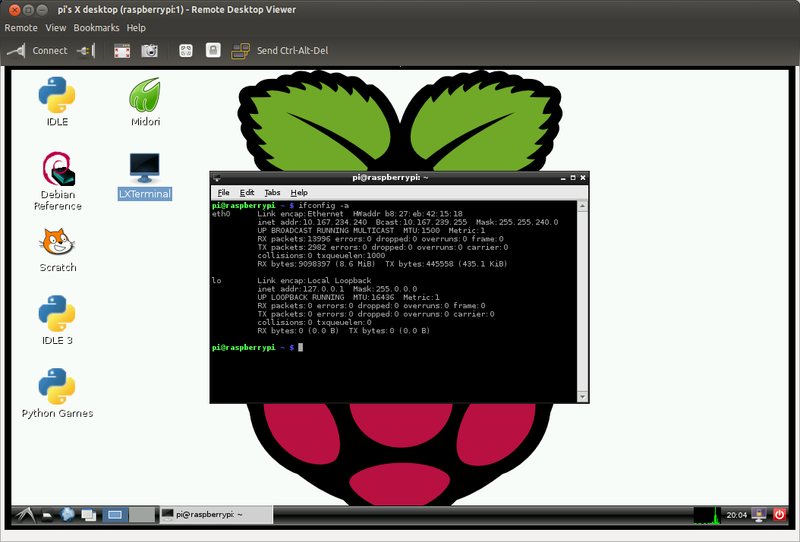 I'm using 2012-07-15-wheezy-raspbian.zip directly from Raspberry Pi's download page. Install the OS onto the SD Card as per the RPi Easy SD Card Setup instructions. The actions you take in this step really depend on how much control you have over your network. Full network configuration instructions can be found on the Debian wiki. Modify the etc/dhcp/dhclient-enter-hooks.d/debug file on the SD card and change RUN="no" on line 10 to RUN="yes" and save the file. Insert your newly "installed" SD card into your RPi. Connect the network cable and power and boot the RPi. Leave it for a few minutes to boot completely and obtain an IP address. Sun Jul 15 19:42:26 UTC 2012: entering /sbin, dumping variables. Take note of the IP address. Thanks to the fact that DHCP will always try and reuse IP addresses requested by a client in a short period of time, we can be pretty confident we'll get the same IP address when we next boot the RPi (provided we don't leave it too long). Now you know the IP address of your RPi simply power it up and login using the default login details. Connect to the VNC server running on your RPi on port 5901 using your remote desktop client of choice. I use Ubuntu's Remote Desktop. At this point you may want to consider adding your own user and either remove the default user or at least change the default password. I'll leave that to you to decide.